It was a time of grueling air combat and continuous sorties facing overwhelming odds. A time of wrecked nerves, fatigue, and the constant reality that the end was near for the men and machines of Hitler’s Luftwaffe. Nevertheless, men flew into combat time and time again, defending their solemn oath to fight and die for the Fatherland! 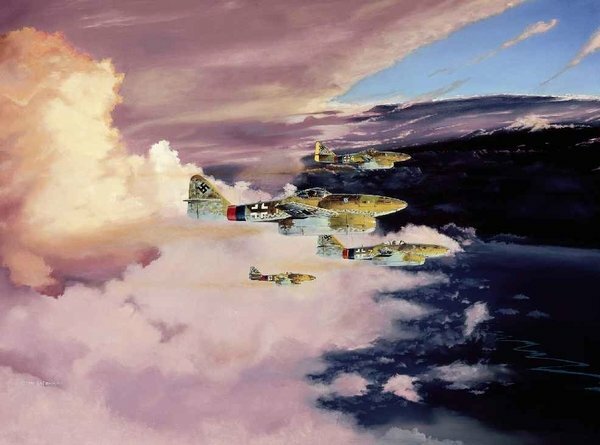 Brian Bateman’s print, “Thunder from the Heavens,” depicts the pilots and machines of JG7, the first operational jet fighter group to be formed after the remotely successful EKDO 262. Flying high above the ruins of the Reich in the beauty of an early evening sky, it’s hard to realize the enormity of destruction to the scorched earth below. Set in early March, 1945, Brian’s painting conveys the beauty of these sleek machines of war, contrasting with the peaceful surrounding of the coming spring evening. Each print is on acid free, high quality stock, with a decorative border treatment. Includes Certificate of Authenticity.